May Ph.D. graduate Michael Evans continues research on carbonates on Mars meteorites through accepted position at NASA Johnson Space Center. Michael Evans, a May 2017 graduate of the Ph.D. program in the Department of Oceanography, has accepted a position as a Planetary Scientist at NASA’s Johnson Space Center in the Astromaterials Research and Exploration Science division. With a background in oceanography, it might be hard to image how such expertise can be applied to extraterrestrial research. However, knowledge gained from studying processes on Earth through geochemistry, stable isotope analysis and climate change assessment is a key building block to understanding the origins and chemical changes in our solar system. In particular, Michael Evans will analyze the stable isotopes of carbon and oxygen in carbonates from martian and other meteorites collected in Antarctica. Carbonates formed on Mars record its aqueous conditions, but the meteorites can also be contaminated with carbonates formed from Earth. Thus, a research challenge as been to identify which planet the carbonates originated from. Mars is one of eight planets orbiting the sun and is fourth away in distance (Earth is third). The environment on Mars is well below freezing at an average of -80 °F and the rocky surface is scattered with former volcanoes, craters and canyons (NASA.org). Known as the red planet due to its iron-rich soils, Mars offers scientists a rare and stimulating study environment for understanding planetary origin and the potential for extraterrestrial life. Michael Evens (third from left) with his Ph.D. committee, Drs. 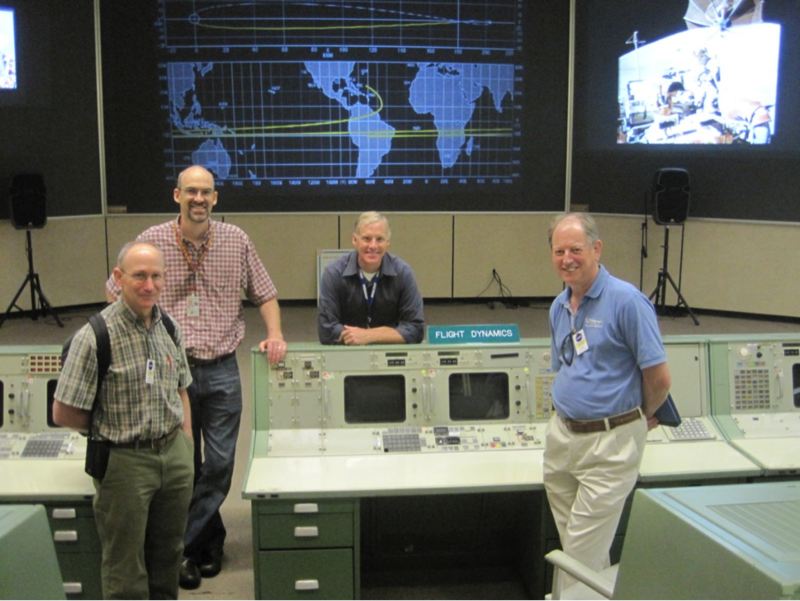 Ethan Grossmann, Paul Niles and Piers Chapman, at Michael’s old desk the original control room at NASA's Johnson Space Center. Committee members not pictured: Dr. Katie Shamberger and Dr. Niall Slowey. Beginning with his acceptance to the NASA Pathways Program during his second year of his Ph.D., Michael Evans instilled a close relationship between the Department of Oceanography and the NASA Johnson Space Center. His research was coordinated by a Civil Servant Supervisor, Dr. Paul Niles, who worked closely with his Texas A&M advisor Dr. Piers Chapman, opening a branch of opportunity for current and future students to work at the various field centers at NASA. Through his background in oceanography, Michael aspires to expand our understanding of planetary chemistry and geology by taking advantage of the “scientific procedure and analysis based upon decades of research completed by oceanographers and geologists alike studying biogenic carbonates, including work at Texas A&M.” He will truly make a splash at NASA and hopes to continue his relationship with Texas A&M University. 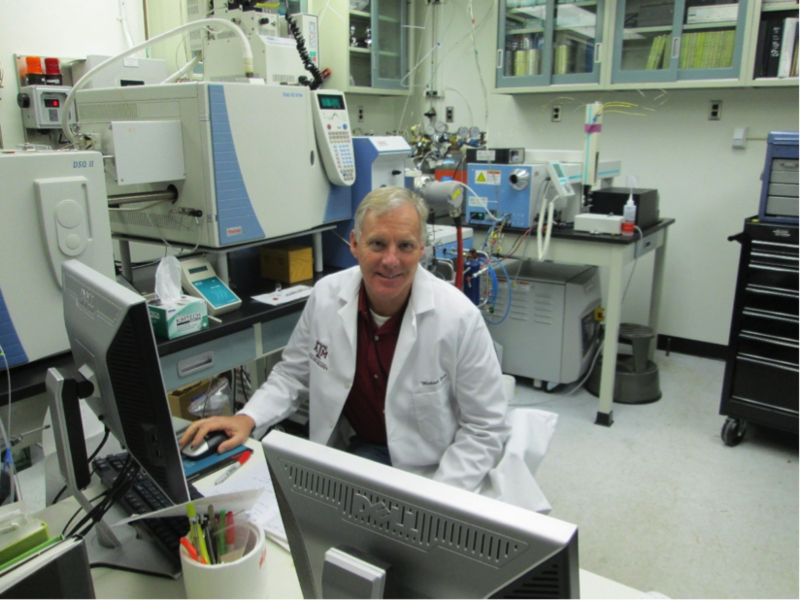 For more information on his current and upcoming research, please contact Michael Evans at mevans@ocean.tamu.edu.